These types of tube end forming machines or swagging machines are most commonly used in attaching fittings to pipes or cables. Swage is used to flare large bandsaw or circle saw teeth, which increases the width of the cut. There is a clamp attached to die to the tooth and the eccentric die is rotated to swag the tip. In ammunition production, swaged bullets are bullets manufactured by swaging room temperature metals into a die to form it into the shape of a bullet. Swaged bullets, as they are formed at the temperature at which they will be used, can be formed in molds of the exact desired size. Swaged bullets are generally more precise than cast bullets. Swagging provides more controlled and cost-effective alternative to shooting the rubber part into a metal sleeve. 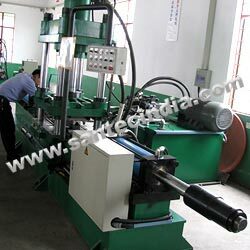 In these swagging machines, there is an intensive and less dependable secondary operation needed to finish the product. In surgery, the threads used in sutures are swaged to an eyeless needle in order to prevent damage as the needle and suture thread are drawn through the wound.